No one who loves either one of them wants to remember them for how they died. Their depression seemed almost perfectly hidden, the risk of ending their lives unrecognized. Those lives epitomized what many people dream — extremely hard work that had culminated in wealth, status, recognition, respect. Even fame. Getting to the top of their game. But there were mostly hidden vulnerabilities, secret destructive thoughts that led to suicide. Kate Spade was being treated for depression and anxiety. We don’t know what exactly that means in the moment. Anthony Bourdain is described by his long-time friend, Eric Ripert, as having recent dark thoughts. It wasn’t enough to keep them alive. Michael Yapko, an internationally known expert on depression, gives us the most recent accurate information about depression and its rising prominence in the world. It’s not a disorder that has one cause. Its presentation can be unique from person to person. Suddenly everyone’s waking up to the idea that suicide has been increasing at alarmingly strong rates. Not since Robin Williams’ suicide have people been as keenly aware of that fact. One of those presentations is what I’ve termed Perfectly Hidden Depression. I talk about it candidly on this video presented by The Mighty. Here is another, much shorter take on PHD. Since writing and speaking about PHD, so many people have contacted me about what they’ve been hiding for so long. Early trauma or abuse that has stayed a secret, rigid punitive families where sadness, disappointment or grief weren’t allowed to be expressed, taking care of alcoholic parents whose need swallowed your own, feeling as if perfection and being a star was the only way to be loved and valued, or being loved conditionally where you had to meet the high expectations of parents or risk rejection. 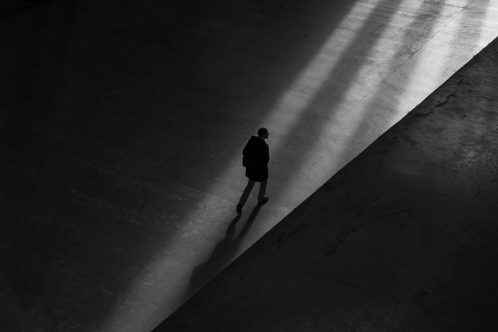 These and many other paths can lead to the choice to hide or the need to look perfect, where all the while, there is a darkness underneath that no amount of success can soothe. Another question to ask… can you be vulnerable? The possibility of PHD brings up this issue. Are we asking the right questions that might determine if someone might kill themselves? We hear experts reminding us of what to look for in depression — isolation, not enjoying things that were previously enjoyed, a noticeable depressed mood. But what about the ability to be vulnerable? Do you — can you allow others to see that you’re struggling? If PHD is the case, it’s this question that must be answered. And for perfectionists, people with PHD — the answer is no. And if the answer is no, then you wouldn’t say you were thinking of killing yourself either. It’s chilling to think about — and research is backing it up, finding strong links between perfectionism and suicide. I have no idea whether these two people would’ve called themselves perfectionists. Yet the quality and quantity of their work seems to suggest such. It reflected the seeking of excellence and the desire to engage with life, beauty and adventure, taking monumental risks along the way. 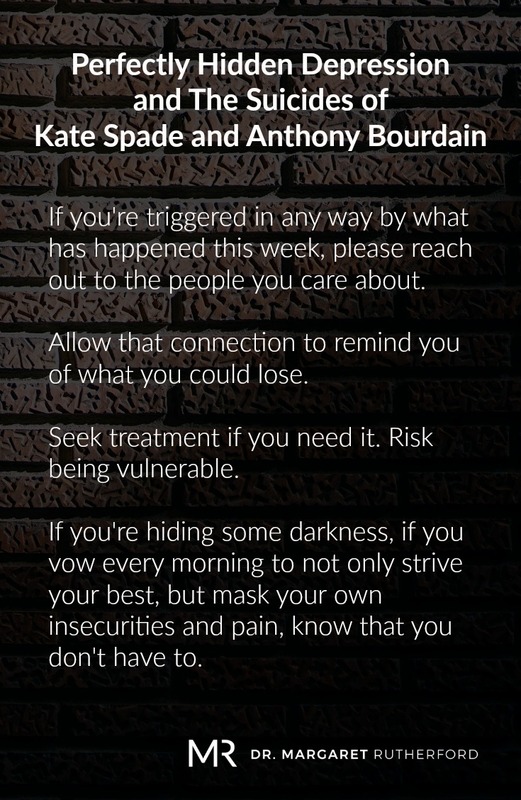 If you’re triggered in any way by what has happened this week, please reach out to the people you care about. Allow that connection to remind you of what you could lose. Seek treatment if you need it. Risk being vulnerable. If you’re hiding some darkness, if you vow every morning to not only strive your best, but mask your own insecurities and pain, know that you don’t have to. As Brene Brown’s research and wonderful books portray, there is immense freedom and power that can be gained from openness and vulnerability. Allow the sudden deaths of these two people to help you recognize that emotions and impulses can get way out of hand, very quickly — that you can take only so much pressure. You don’t have to be famous to hide. You don’t have to have written a cookbook, be a famous TV celebrity or a fashion savant to feel despair and loneliness.. You could be anybody, anywhere, dealing with an imploding depression that’s slowly eating away your vitality, although no one can truly see it. Here is one man’s story. Please know you’re not alone. And like many others who’ve abandoned perfectionism for honesty and depth of feeling, even if initially the feelings are quite painful, you can get better. Our hearts go out to the people who are mourning their family member or friend. It’s a long road of healing.